I have decided it's time I eventually got round to posting a summer recipe, this is a great recipe for the summer and is called chocolate pots duet because they work so well together and work in perfect harmony.I only tried this dish a few weeks ago and I have to admit it was really good it can be accompanied with brownies or cookies or any selection of your favourite fruits for dipping Strawberries, Bananas,Kiwi fruit the list is endless and I'm sure you all have your own preferences so without further ado here is the recipe i hope you all enjoy. Preheat the oven to 160C and grease an 18cm cake pan. Melt the butter and chocolate in a bowl over a bain marie, combine until smooth and set aside to cool slightly. Beat the sugar, vanilla extract and salt into the chocolate mix. Add one egg and beat until well combined. Add the second egg and beat again then repeat for the third egg. Pour the mix into the greased cake pan and bake for 40 minutes. Once cooked, leave to cool. Using a cutter, cut 4 circles to fit into the bottom of the ramekins and slice what’s left into small cubes. Melt the chocolate over a bain marie and set aside until cooled. Whisk the cream until it forms soft peaks and fold in the Baileys. Beat the mascarpone until smooth. Add in the Baileys cream mixture and combine. Pour the cooled melted chocolate into the cream mix and delicately ripple through (don’t combine completely - it should keep the pattern). Add a small round of brownie mix to two ramekins. Top each with the chocolate cream mix and garnish with a whole strawberry. Once melted, gradually add the olive oil and cream, whisking continuously until thick and glossy. Add a small round of brownie mix to two ramekins. Top with the mousse and garnish with chocolate shavings. Add one of each pot to the plate. 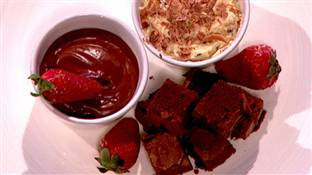 Add some brownie squares at the bottom of the plate and garnish with a strawberry either side of the brownies. The largest chocolate ever made was a chocolate marzipan. It was made in the Netherlands over a 3-day period and weighed 4,078 lbs! Hi Mac! I hope you are enjoying the summer. :-) Well, I'm sure you are with this delicious chocolate pots... I'm about to go to bed and I will definitely dream about having this! Looks really delicous! By the way, I *finally* created my button if you would like to switch - it's on my side bar and says "Grab My Button". But it's really optional. :-) Have a great day! I know that taste is so decadent,i wanna try it! This would be great any season of the year! I'm glad you like it, and yes It would taste good any time of the year.Chocolate all ways tastes fab ,hoping to post some winter chocolate recipes soon.